You're not throwing home runs. This is what my four year old told me while I pitched to him one night after he struck out. I told him I don't throw home runs, home runs are something that you have to hit. To which he informs me in his frustrated tone, "well you're not throwing pitches so I can hit home runs!" It made me realize we can often find ourselves whining and complaining to God about this very idea. We want life to pitch it right down the middle of the plate. Better yet, just set it up on a tee for us to smash. We want to know where the pitch is going and that it's going to be a pitch we can hit for a home run that follows with us feeling pretty pleased with ourselves as we comfortably trot around the bases. Well on August 26th, 2015 we were thrown a curve ball as our life took a sudden and unexpected turn with Kaleb's early and necessary arrival. Mix that with all of his health issues such as a brain bleed, heart defect, chronic lung disease, and Down syndrome. Then a year ago on December 9th, 2015, we brought Kaleb home from the NICU. It was a long awaited home run that brought tears to our eyes as we trotted the bases, or more accurately as we wheeled Kaleb from the NICU. Leaving the NICU though was like getting thrown a change up. For those that are not baseball fans, a change up is a slow pitch that throws the batters off of their game as they were expecting a faster pitch. The NICU journey was ending but another chapter with its own challenges was just beginning. I say it was a change up pitch for a few reasons. 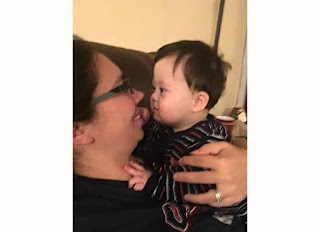 We were definitely slower at getting ready and doing our day to day tasks as we juggled monitors and oxygen and learned to take care of him without a NICU staff and 24 hour care. It took only two hours of being home for us to realize this as we tried to undress him and get him ready for bed with cords everywhere. Or I could mention the next day as it took two of us to gather everything, get him ready, loaded up, and to his pediatrician. Where we proceeded to look like amateurs and drop his oxygen. Soon we were able to take that pitch and turn it into a double as we could be found going to and from appointments with monitors, oxygen, diaper bag, and medical file handled like a pro. All the while administering a feed through his g tube while pushing his stroller to his appointment. Have to admit I was pretty proud of that hit, the kind that can make you feel like super mom. It was another change up as it was slow going coming off of the medical equipment. Leaving the NICU didn't mean leaving the equipment behind. Little by little the amount of oxygen was decreased and then dropped from days and then finally dropped completely. The amount of equipment and medication needed continued to get smaller, until we were left with a g tube. It took longer than we hoped it would but in the process we learned and managed. We learned to care for his needs, and it gave us a better respect for others who have been both parent and nurse for their child. 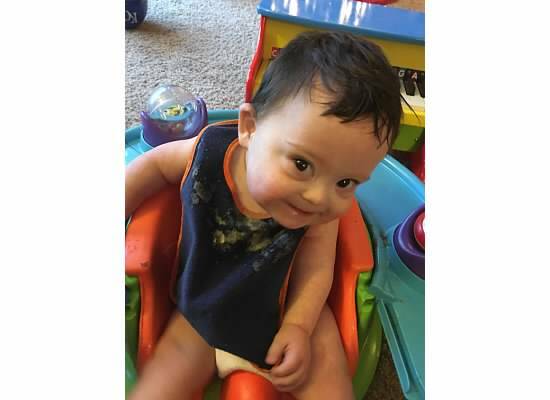 Down syndrome is also a change up from a typical child. 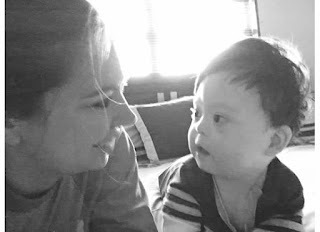 Those with Down syndrome will get there, but growing and hitting milestones is just at a slower pace. Some parents brag about how quickly or easily their child picked up a skill. For parents of children with Down syndrome, it's often not quick or easy. It has to be taught, practiced, and done in the child's own time. It can be trying, especially on bad days. However, it makes every milestone no matter how small that much bigger a celebration. While we still wait on some milestones such as crawling or his first words, there has been great joy (and often happy tears) that accompany the milestones accomplished. There were times in the past year like open heart surgery that felt like I was one out and one strike away from defeat. That wasn't the only time I had to battle in the batter's box as it felt that I fouled off strike after strike. Those were the times I was grateful that when it simply was not my night, that I had great teammates. Just like baseball, life is not a one man show. It's a group effort and while we celebrate the first year of Kaleb being home. I also celebrate my team; my husband, oldest son, both sets of grandparents, and all of our other family and friends who continue to step up and be a part. Not only have we seen Kaleb grow and learn but the same can be said for our family and our marriage. Finally, it has drawn me closer to my swing coach. Ephesians talks about putting on the full armor of God. In baseball you don't necessarily go into the batter's box with a shield or a sword. However, with faith and His word I can go up to the plate and be sure of my swing. I'm sure life will continue to deliver pitch after pitch and paint the corners of the strike zone, always keeping us on toes. However, I can rest in the knowledge that God is painting a much bigger and brighter picture than I could have ever imagined and with His help I can be confident as I step up to the plate. One year at home down. On to the next chapter and pitch... Batter up!